After catching up on the much needed sleep that was missed during the race, it’s now time to reflect on another magnificent Le Mans 24 Hours, which frenetic action on track and feel good stories throughout the paddock. With initial talk of a titanic battle between the four manufactures Toyota,Audi,Porsche and debutants Nissan, it quickly became clear during the race week that the race for victory would be an all German affair between Audi and Porsche. Porsche stole the first march by claiming a track record pole, with a scintillating 3m16.887 time, a full three seconds quicker than the fastest Audi could produce. With the reliability and success record of Audi however, they still went into the race as slight favourites. From the moment the lights went out it was a frantic battle between the might of Porsche and Audi, with Audi seemingly taking a slight early advantage in the hotter mid-afternoon conditions. After the first few hours things seemed to change for Audi, with niggly issues which the team was previously avoid began affecting them. Firstly the team’s lead No 7 entry suffered a puncture, before the sister No 8 entry was involved with a collision with some GTE traffic, dropping the car to 8th overall after a few minutes in the pits for repairs. No 8 Audi returning to the pits after it’s crash in the early hours of the race. Thanks to Motorsport.com for this high quality photo. Porsche kept running at the front with metronomic pace from their No 17 and No 19 entries, with their No 18 entry affected by two off’s at Mulsanne corner, putting them laps down from the opening six hours. Going into the nightfall hours no body was any closer to predicting an eventual winner, such was the unpredictability of the leading fight. The No 17 Porsche was content at the front, until in the very early hours of night time Mark Webber was hit with a 1 minute stop/go penalty after Brendan Hartley overtook under yellow flags, promoting a see-saw battle between the No 7 and No 19 Porsche to the front, as both swapped the lead due to their differing pit schedules. During the cool of night Porsche came into their own, as they regularly lapped several seconds per lap quicker than Audi could manage. This battle continued all night and into the early hours of daylight running on Sunday morning. It was clear that Porsche had an advantage of roughly 1 minute 30 seconds over the leading No 7 Audi, although as temperatures would rise as the day wore on, Audi were likely to strike back at Porsche. The leading battle was effectively over the moment the No 7 Audi was forced into the pits on Sunday morning, for repairs that would put the car two laps down on the leading No 19 Porsche. From here the lone Audi left in the hunt was their additional third No 9 entry, although once both this car and the No 8 car also needed repairs in the early hours of Sunday morning, victory was virtually assured for Porsche. The leading No 19 Porsche which ran faultlessly throughout the race. 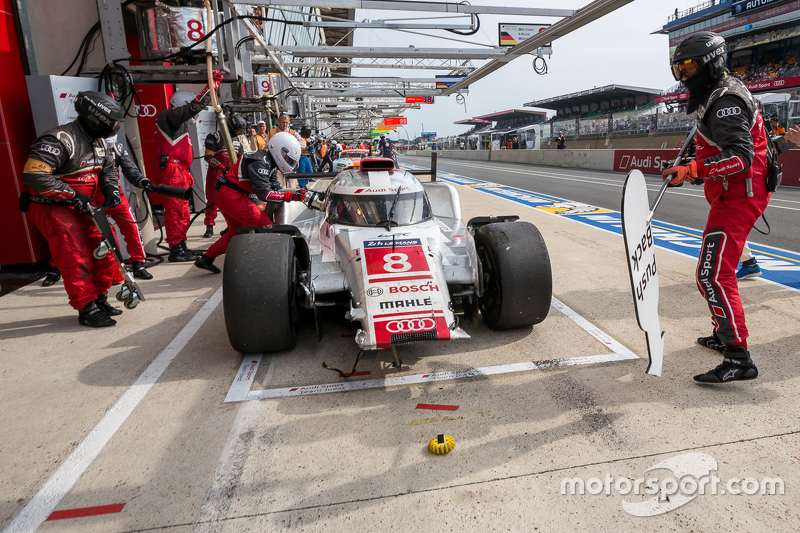 Thanks once again to Motorsport.com for this high quality photo.With only mechanical or driver incidents between Porsche and a 17th victory at Le Mans, both the No 19 and No 17 entry were able to take their foot off the gas slightly, despite a desperate charge by Audi superstar Andre Lotterer in the No 7 Audi, including setting the fastest race lap in his mid-morning charge. 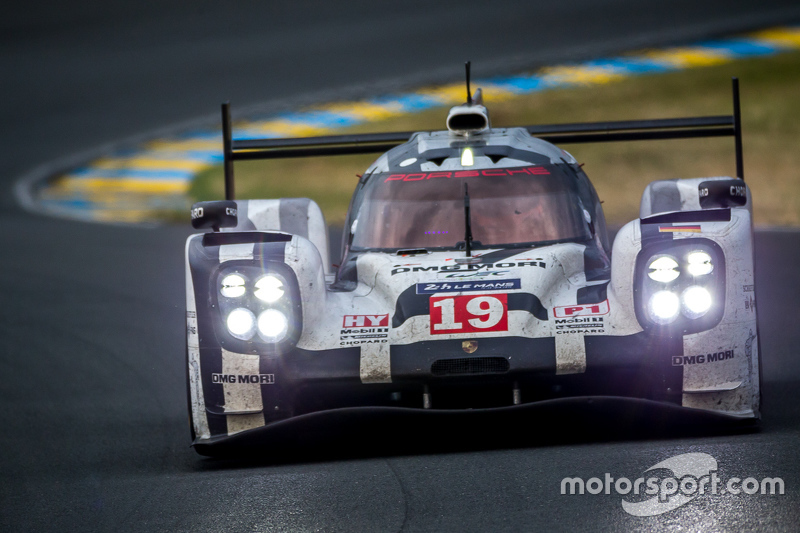 The final few hours were all about brining their cars home to victory, and after 24 hours of racing the No 19 Porsche 919 Hybrid was greeted with the chequered flag. A fairy tale had been created, with a highly coveted victory on their debut for both Earl Bamber and F1 star Nico Hulkenberg, alongside the Brit Nick Tandy. No one could begrudge victory for the trio and Porsche, with a 1-2 showing it had truly returned to Le Mans after 18 months back in the LMP1 category. Whilst the second place crew of Brendan Hartley, Mark Webber and Timo Bernhard may be slightly disappointed with second, they can take a lot of heart from their performance all race. 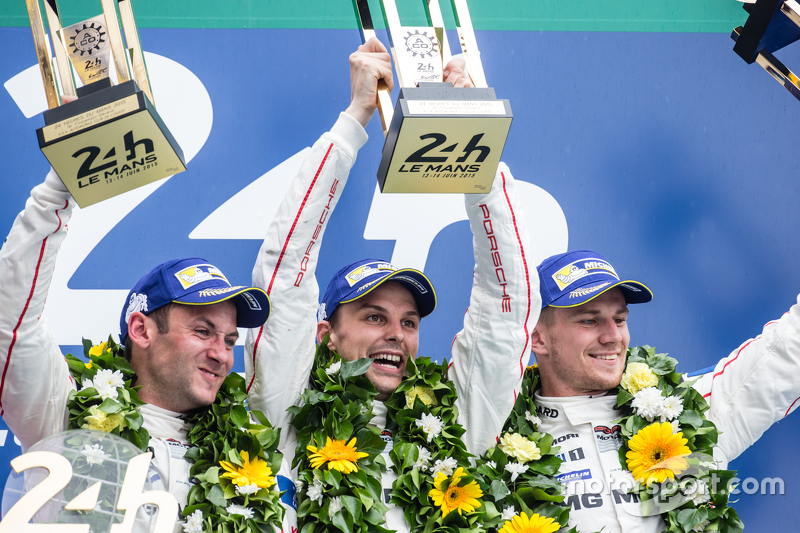 A photo that perfectly encapsulates what it means to win Le Mans for Porsche drivers Nick Tandy, Earl Bamber and Nico Hulkenberg. Thanks to Motorsport.com for this high quality photo. In the LMP2 class it was a nice class win for the Asian based KCMG team, who took their new Oreca 05 to victory in the hands of a very impressive Richard Bradley and Matt Howson, who were partnered by on-loan former Toyota factory driver Nicolas Lapierre. They fought off the charging Jota sport team, winners last year, and the G-Drive Ligier led by Brit Sam Bird. For Corvette racing it was a week of both ecstasy and despair, as the team first lost one of it’s two factory Chevrolet Corvette C7.R cars to a qualifying accident in the Porsche curves on Thursday. From this the team rallied behind their No 64 Corvette, which was brilliantly driven to a very hard fought GTE Pro victory in the hands of Oliver Gavin, Tommy Milner and Jordan Taylor. 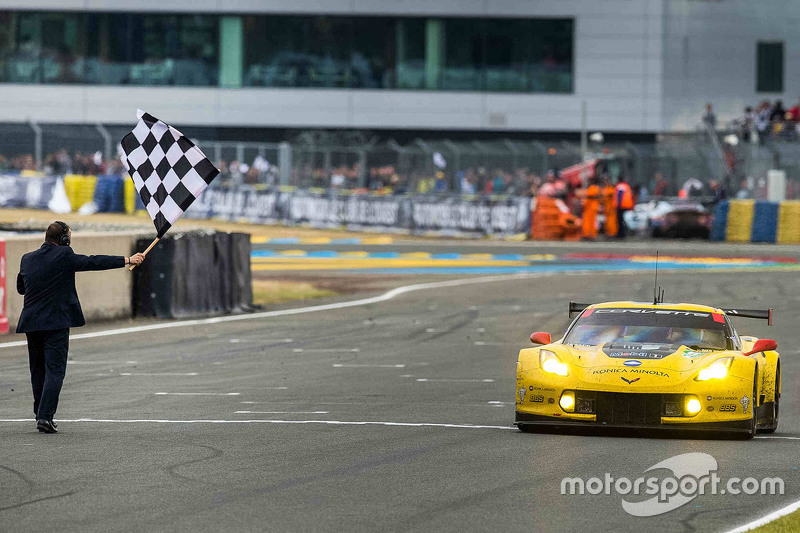 The victorious No 64 Corvette racing C7.R takes the flag after 24 hours fought hours for their GTE Pro victory. Thanks to Motorsport.com for this high quality photo. In the GTE Am class there was despair for the dominant No 98 Aston Martin racing team, as their Vantage GTE was only just over an hour from a dominant class victory. Sadly for the team their car was shunted by the team’s amateur driver Paul Dalla Lana at the final Ford chicanes, although a mechanical fault looked to have caused the crash. This was of little consolation to the team however, as they were forced to watch the SMP racing No 72 Ferrari F458 Italia, driven admirably by works Ferrari GT driver Andrea Bertolini, supported by Russian drivers Viktor Shaitar and Aleksey Basov. To even finish at Le Mans is an achievement, therefore everyone deserves applause for their efforts this week, along with a huge round of applause for all the marshals who helped keep the race on track for all 24 hours. Whilst the race was a disappointment for the likes of Nissan and Toyota, they will all be back next year hungry for a better result. This great race once again showed the very best of the World Endurance Championship, and sportscar racing in general. If you want a glimpse at what Le Mans means to everyone involved, look at the joyous reaction of successful actor and GT racer Patrick Dempsey as his No 77 Porsche 911 RSR finished 2nd in the GTE Am class yesterday. For me, sportscar racing and the WEC are the most competitive and best form of top line motorsport in the world, with more overtaking between the leaders in the opening hour than an entire half season of F1. As F1 seemingly looks to destroy itself at the moment with cars that don’t appeal to fans, constant on-fighting on all key issues between the teams, and a lack of genuine overtaking which have left plenty wondering whether it’s even worth watching anymore. I very much look forward to watching the rest of the WEC season, and with many manufactures seriously considering joining Ford in announcing a sportscar programme in the next few years, the series looks to have earned it’s status as the most attractive series in the world right now for manufactures, thanks to the WEC open rule book based on fuel limits, with plenty of technical scope for different engines and hybrid power systems. Roll on the rest of the WEC season and especially Le Mans next year. 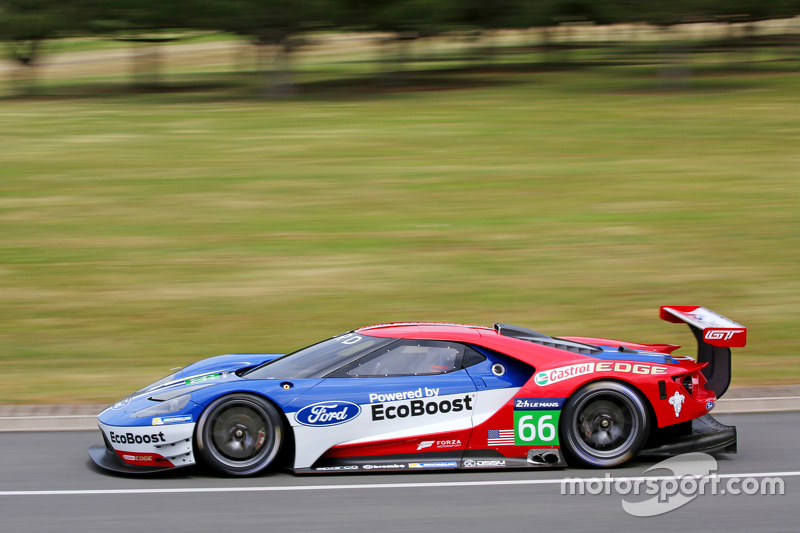 A final thanks has to go to Motorsport.com for their amazing high quality photos which can only be found on their site http://www.Motorsport.com A glimpse into the future with a photo of the newly announced Ford GT race programme which will see them return to Le Mans next year in the GTE Pro class. Thanks to Motorsport.com for this high quality photo.